•	Name : Dr.Hussein Hameed Hassan Al-turnchi •	Nationality : Iraqi •	Birth : Al-najaf Al-ashraf 14-3-1969 •	Adress: Al-najaf Al-ashraf / Assalam quarter •	Language: Arabic/ English •	Degree: MSc •	General specialization: Biology •	Fine specialization : Molecular genetics •	Lectures in RT-qPCR technique in the faculty of teaching for girls/ university of Kufa 2014. •	Member of the faculty of physical planning university of Kufa 2014. • Advisory researcher in the Local Environmental Research Center / Babilon university 2003-2011. •	Technician in the environmental health lab. /collage of engineering / Babilon university 1999-203. 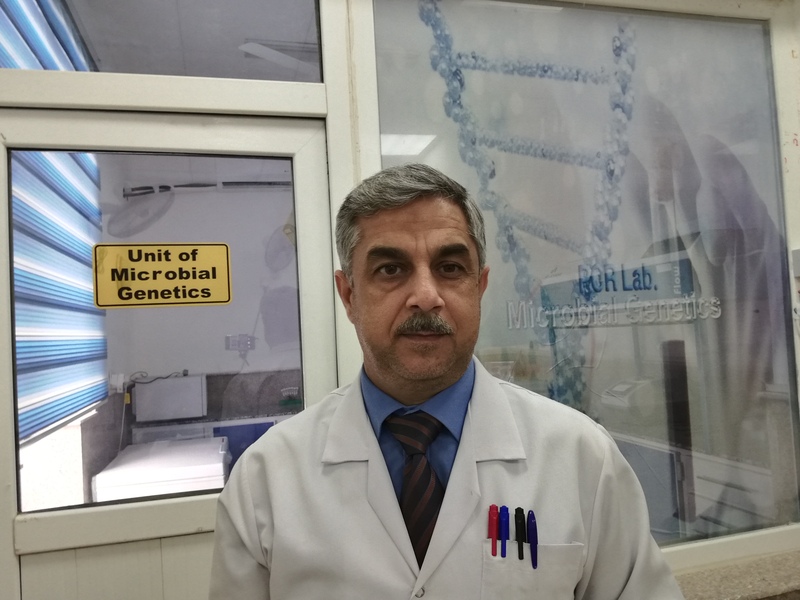 •	Lecturer of the microbiology in Kufa medical technical institute 1997-1998. •	Technician in laboratory of the airforce hospital 1994-1995. •	Member of the Arab biologists committee 1992. •	Member of the Iraqi microbiologists committee 1992. •	Bsc biology/ faculity of science/ university of mustansiriya 1991-1992. Training course in Iraq: •	Training course on Real time PCR in the faculity of veterinary / university of Kufa (2013). •	Training course in "university training and teaching methods" 2014. •	Training course in IC3 (2010). •	Training course in computer techniques (2000). •	Training course in advanced jet management (2004) Published Researches: •	MSc thesis:" Assessment of UGT1A1 gene expression in hyperbilirubinemic neonates" •	The role of gender in UGT1A1 gene expression in hyperbilirubinemic neonates. (published)medical journal of Kerbela 2014 . •	Assessment of antimicrobial activity of( hibiscus sabdrifa L.) extract on the G+ and G- bacteria. (published).journal of science/ university of babel 2000. •	Impact of air pollution on hypersensitivity patients in Hilla city during the year 2003.the ninth conference of university of babel.2005 •	Impact of air pollution on hypersensitivity patients in the governorates of Karbala and Al-najaf Al-Ashraf during the year 2003. Research plan of LERC/ university of babel 2006. •	Assessment of organic pollution of Euphrates river in Kufa city. journal of science/ university of babel 2001 •	A questionnaire study for the smoking and passive smoking in Hilla city. •	Impact of some of exhaust pollutants of domestic electric generators on general health in Al- Mortadha Quarter in Hilla city.conference of the university of quadisiya. •	Assessment of biogas production by different types of animal wastes. Annual research plan of LERC/ university of babel. •	In vitro evaluation of anti cariogenic phage cocktail use in oral hygiene. Annual research plan of LERC/ university of babel. Symposia : •	Impact of electric generators exhaust on public helth (university of quadisiya). •	Techniques of water purification. Lecture in genotoxins (university of babil). •	Bacteriophages as alternative therapy for antibiotics (university of Kufa). •	Bacteriophages is natural sustainable resource (university of babil). Conferences: •	First conference for environmental researches. (university of Babil) •	Second conference for environmental researches. (university of quadisiya) •	The ninth conference of university of babil. (university of Babil) •	National conference of the research centers of the ministry of higher education and scientific research ( university of Kufa). Certificates: 4 Acknowledgments: •	Minister of higher education and scientific research 5 •	Principal of university of kufa 5 •	Principal of university of Babil: 7 •	Vice principal of university of babel: 2 •	Faculty deans: 6 •	Head of department: 1 •	Governor of Babil for scientific public duty: 2 •	Governor of Al-Najaf Al-Ashraf for scientific duty: 1 •	Head of the research center: 2 Publications: •	Monthly bulletin of local environmental research center. •	"Bird's flue understanding, prevention and self treatment". Responsibilities: •	Vice manager of the biological resources dept./ LERC/ university of Babil. •	Organizer for scientific affairs and conferences in LERC / university of Babil. •	Director of Inventory property /University Babel 2006. •	Board warden of the faculty of physical planning.